Sadio Mane has responded in classy fashion to his sending off against Manchester City by sending his best wishes to goalkeeper Ederson. The Senegalese forward was controversially dismissed in the first half after his high foot accidentally collided with the face of the Brazilian shot-stopper. 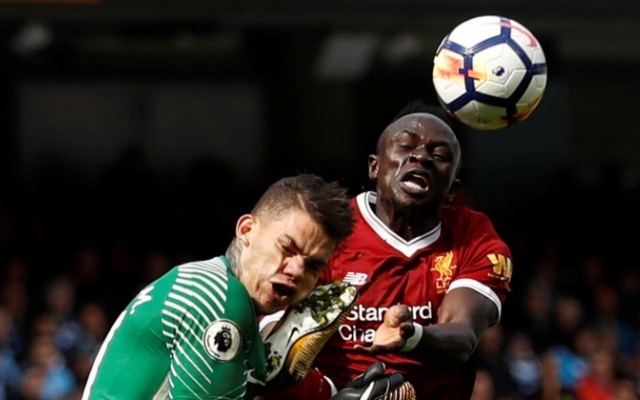 With both eyes on the ball, no malice behind the challenge and a clear-cut goal-scoring opportunity on the line, it proved to be a decision very few could agree with as Mane did all he could do to try and win the ball. Though understandably angry after the incident, the Liverpool star was at hand to deliver an admirable message to his opponent, who was forced off as a result. Mane is now expected to miss up to three games, including league games against Burnley and Leicester, as well as a Caraboa Cup game against the latter. He will, however, be available in the Champions League, with the Reds set to start their group stage campaign when they host Sevilla at Anfield on Wednesday. If replays of the challenge itself aren’t enough to prove there was no intention, Mane’s apology confirms it.